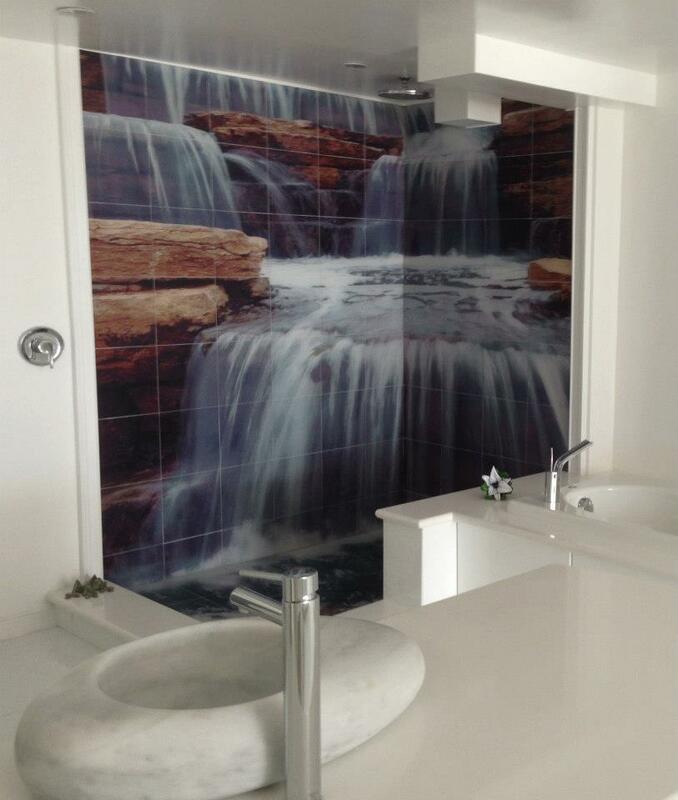 You may have seen pictures elsewhere, but we are the manufacturer of these beautiful waterfall shower tile murals! We have successfully custom fit many variations of these beautiful shower panels all over the United States, and we can ship them anywhere! Since every shower is going to be different, so is each mural! We are able to accommodate spaces of all sizes. We have different sizes and types of tile to choose from to fit your space perfectly. “I am a land developer and builder of thirty years. My wife and I used Tile by Design to custom make tiles for our Penthouse Master Bath shower area. 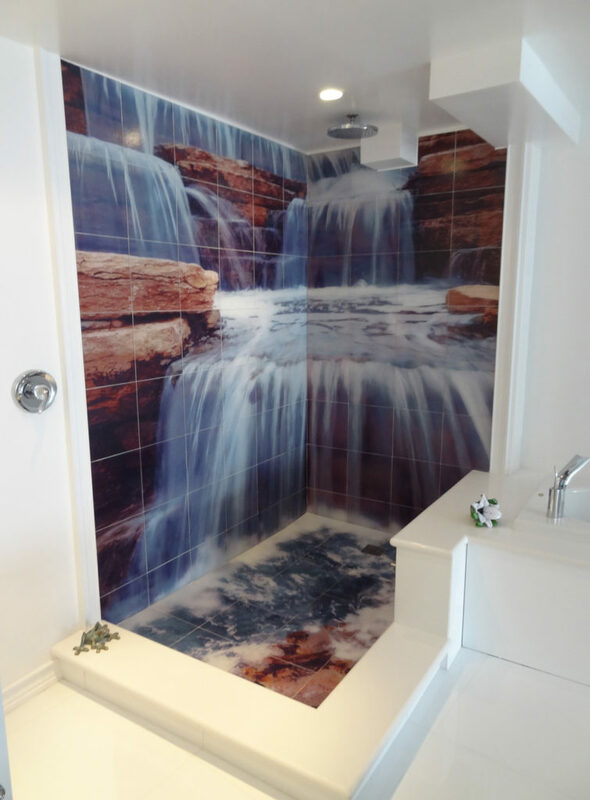 A photograph of a waterfall that we sent them was transferred onto the back of tempered glass tiles. They “photo shopped” the floor of the shower using their magic. The tiles were numbered and carefully shipped to our location in Florida. None were damaged. It has become a main focal point of the entire job. 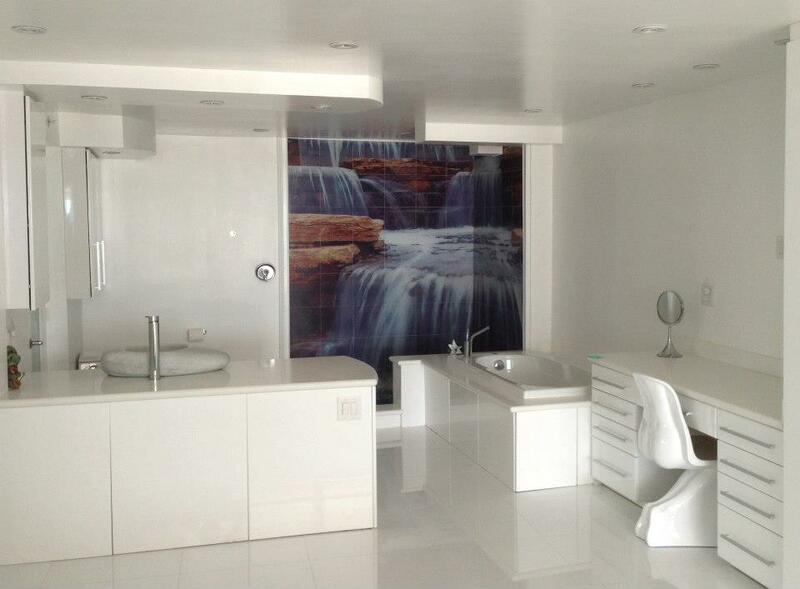 Do you like the idea of covering your shower walls with a full panel design, but don’t like this particular image? Not a problem! We have 1,000s of images you can choose from to find something that matches your tastes. Deserts, snowy mountainsides, beach scenes, and even different waterfalls are all possible! Designers, architects, and contractors: Clients are always on the hunt for a ‘wow factor’ item that will set their project apart from their cookie cutter neighbors. Adding our shower tile murals to your offering is a great way to create a focal point in any room! Just like all of our murals, we include very simple to follow installation instructions. Any reputable tile installer or contractor will be able to install these tiles with ease. Dye Sublimation Tiles vs Kiln Fired Tiles: What’s the difference?